Winner Casino is licensed and regulated in Antigua and Barbuda and the games are independently reviewed by Technical Systems Testing (TST). 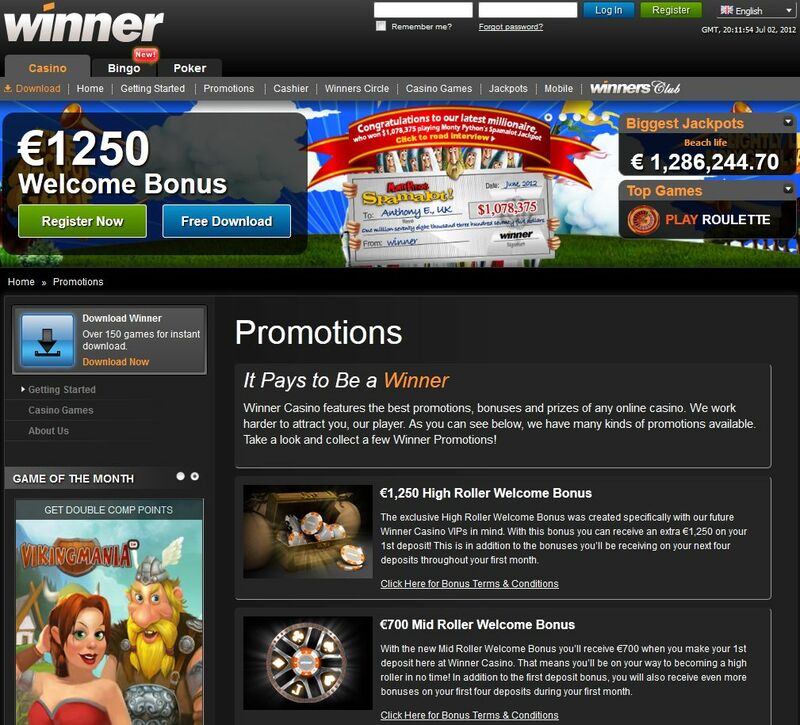 Winner Casino offers a good selection of games and many worthwhile bonuses for all of their players. They run a comprehensive multi-level VIP program and offer 24/7 customer service support. Winner Casino is powered by the online casino software provider, Playtech. The software is available in multiple languages including English, French, German, Danish, Russian, Dutch, Swedish, Polish and Spanish. Winner Casino offers a good selection of games including table games, card games, slots games, live games, video poker, arcade games, Asian games, progressive games and more. Winner Casino offers a number of worthwhile bonuses to its players – both new and old. New players are eligible for a $1,000 welcome bonus package. On your first deposit at the casino you will be eligible for a 100% match deposit bonus up to $300. On your second deposit at the casino you will be eligible for a 150% deposit bonus up to $300 and for the next four months you will be eligible for a 100% match deposit bonus up to $100 each month. High rollers will be eligible to receive up to $2,000 on their first deposit at the casino. If you make a deposit at the casino using an alternative payment option, you will be eligible for an additional 15% deposit bonus. If you refer a friend to the casino you will be awarded with a $50 bonus when your friend signs up to the casino and makes their first deposit. The friend that you referred will also be awarded with a $25 bonus on top of their welcome bonus. 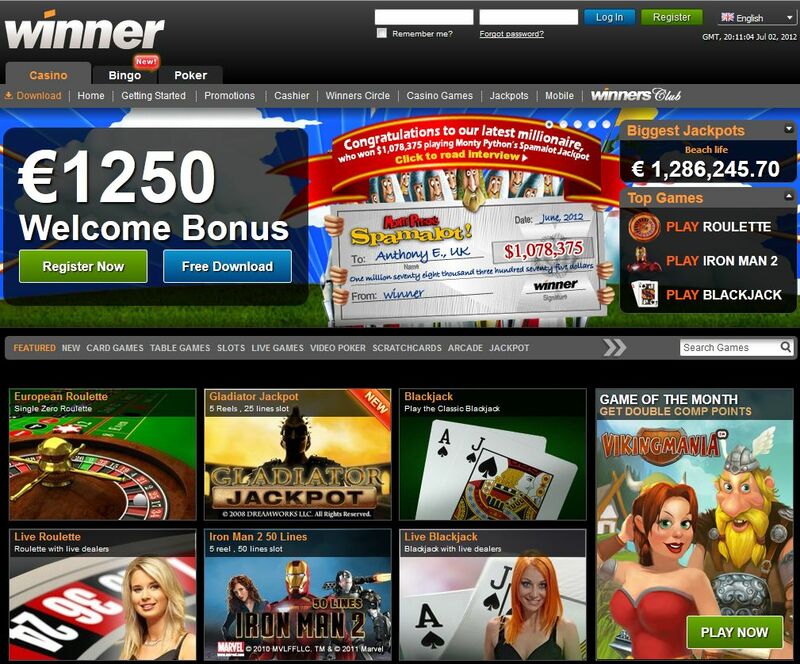 All players at Winner Casino are eligible to earn comp points for every bet that they place. These points can be accumulated and later redeemed for cash. The more points you accumulate, the higher you will move in the VIP program. Winner Casino runs a loyalty program with six tiers – club, select, elite, premium, superior and royal. Members of the VIP program are eligible for special bonuses, tournament qualifications, free gifts, promotional offers and better comp point conversion rates and the higher you are in the program, the better the bonuses you will receive. If you have any queries when playing at Winner Casino you can contact their customer service team which is available 24 hours a day, seven days a week. They can be contacted via email or telephone. Alternatively, you can visit the FAQ section on their website for the answers to general questions. Players can make deposits into their Winner Casino account via a number of safe and convenient methods. These include VISA, Master Card, Diners Club, Maestro, VISA Electron, Delta, Moneybookers, InstaDebit, NETeller, ClickandBuy, Click2Pay, Ukash, Paysafe Card, bank transfer, iDEAL, GiroPay, Nordea, EPS, POLi, WebMoney, Eco Card, UseMyBank, myCitadel, wire transfer and more. All transactions are handled through their financial subsidiary, Redfinger Trading Limited, Cyprus.